British Heart foundation place card. 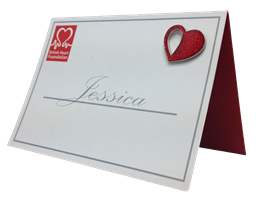 Perfect for weddings and special events to let your guests know that you have made a donation to the British Heart Foundation charity on their behalf. Size: 10.5cm wide x 7.5cm tall when folded. Adding your choice of pin badges to your order means you can create extra special and uniquely personal place cards for your wedding day.